On December 28, 1921 Golden Rule Lodge No. 24 was warranted during the Grand Mastership of Powell K. Martin, to hold its meetings in South Orange, New Jersey. However, in 1926, the Lodge was dissolved and the paraphernalia, which it had used during its short life, was given to Bethel Lodge, No.10 of Orange, New Jersey. Worthy brothers Enoch Brock, Samuel Hunt, Wise Harmon, Howard Longus, and William Ingram had served as Masters of that South Orange Lodge. A Certain number of the brethren who had been members of the Lodge retained the hope of re-establishing themselves as a Lodge at some future time. Their desires were eventually consummated, for those brethren petitioned the M. W. Grand Master, Edgar S. Ballou, for the privilege of establishing a Lodge in Vauxhall, New Jersey, under the name of Golden Rule Lodge #24. The dispensation was granted in September of 1944. The Lodge, having performed its Masonic work in a proficient manner, was granted its warrant at the ninety-seventh annual communication of the Grand Lodge held in Atlantic City, New Jersey, in June of 1945. The officers named in the warrant were Samuel I. Hunt, Worshipful Master; Washington Koonce, Senior Warden; Henry Scott, Junior Warden; John Alston, Treasurer; and I. Thomas Howe, Secretary. During the Grand Mastership of the M.W. Charles W. Campbell, twenty-nine members from Golden Rule Lodge #24 petitioned the Grand Lodge to form a Lodge in Somerville. Hence, in July of 1972, A.B. Cooper Lodge in Somerville, New Jersey was formed. Golden Rule Lodge #24, held its meetings at the Community Center on Berkley Pl. in Vauxhall on the first and third Fridays up until 1974, at which time, under the mastership of Otis Appling, the Lodge relocated its meeting place to Bethel A.M.E. Church on Hilton Avenue in Vauxhall. 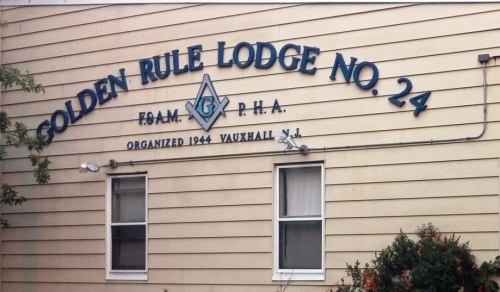 The lodge relocated, once again, under the mastership of Jessie Lowe in 1982, to the Dr. Myra Kearse Center, located at 2410 Springfield Ave. Vauxhall, NJ. With the Guidance of the Grand Architect of the Universe, under the Mastership of Edwin Ross, donations from a number of brothers of Golden Rule Lodge No. 24 and the assistance of the sisters of Golden Rule Chapter No. 50, a Mortgage was obtained and signed by R.W. Louis Glenn and R.W. Arnold Williams on October 24, 1995 for a building at 221 Oswald Place, Vauxhall, NJ which is the new home of the Lodge and Chapter. Golden Rule has produced the following members who were appointed to serve the MWPHGLNJ in the following capacity. We also are very proud to have among us a number of Oziel Grand Chapter Officers including that of Worthy Patron of The Oziel Grand Chapter of the Order of the Eastern Stars PHA of the State of New Jersey in the name of Otis Appling and Arnold Williams. In 2009, Golden Rule was blessed to have its first Junior Grand Warden in June of 2009, first Senior Grand Warden in June of 2010, first Deputy Grandmaster in June of 2011, and in June of 2013 - 2014-15 Most Worshipful Ricardo McNeil Past Grand of The Most Worshipful Prince Hall Grand Lodge in the jurisdiction of New Jersey. With the persistence and guidance of the past masters, and the enthusiasm and strength of our new members, Golden Rule will continue to prosper with every step we take.